La Fermette, a pretty Perigordine, riverside cottage sleeps 6 in comfort and is one of 3 beautiful properties at Le Banquet. The accommodation is spacious & comfortable & consists of well equiped modern kitchen & dining room, ground floor WC, large sitting room opening on to a beautiful riverside terrace with a vine clad loggia. The magnificent oak-beamed master bedroom with king size bed & beautiful en-suite bathroom is on the 2nd floor, whilst the 2 pretty twin bedrooms on the first floor have gorgeous views overlooking the river and share a fabulous bathroom. A tranquil riverside setting in which to relax. All of our cottages are very well equipped, including UK TV, DVD player, dishwasher, washing machine etc. We also provide linen, towels, tea towels, washing up liquid, cleaning materials, bin liners, foil, loo rolls, dishwasher tabs etc. Please see 'About The Property' below for links to the other 2 properties which sleep 4 & 5 at Le Banquet. Karen & Rob welcome you to their charming, 200 year old ensemble of luxury 4 star Perigordine houses nestling deep in the Vezere valley. 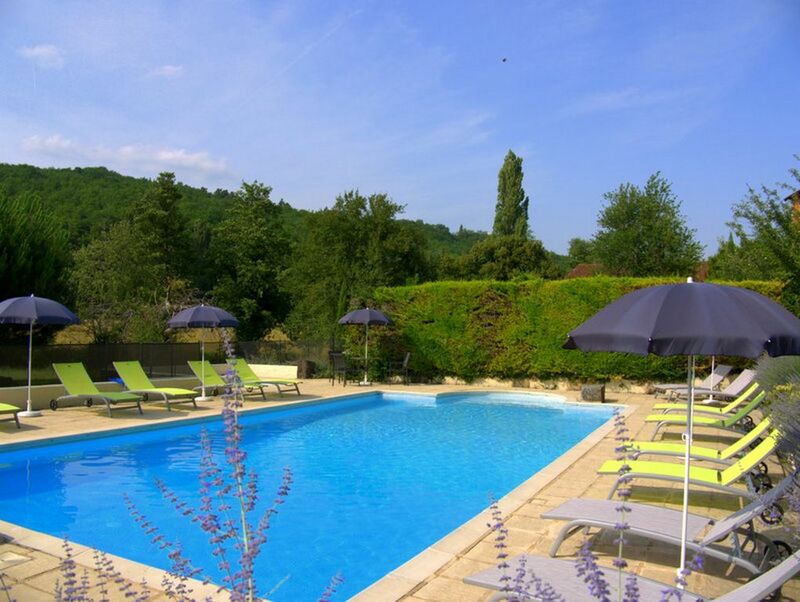 In the most popular part of the Dordogne and on the edge of the world famous village of Les Eyzies these charming homes at Le Banquet have been lovingly restored preserving their character. Recently awarded 4 STARS by the Comité Départemental Du Tourisme De La Dordogne and voted 'Best family self-catering holiday in France' by The Gaurdian newspaper. A pretty river runs through the estate and helps to make the extensive grounds and magnificent gardens at Le Banquet an ideal place for relaxation, with ample shade provided by the apple & pear trees. The large 40ft x 20ft swimming pool & toddler’s splash pool are positioned to gain maximum hours of sunshine with plenty of sun beds, tables & chairs and umbrellas. Children are well catered for with acres of space to play football, cricket or rounders and a play area with swings, slide, basketball net & boules court. The games barn houses table tennis, table football, pool, darts, hopscotch, giant connect 4, loads of board games & plenty of toys for the toddlers.It also houses an extensive DVD library, and an information corner with hundreds of leaflets & books on places to visit and things to do & see in the wonderful local area. Each home is extremely well equipped with all modern comforts including UK satellite TV, DVD player, washing machine, dishwasher, Nespresso coffee machine, etc. together with its own terrace, outside furniture and BBQ. After holidaying in the Dordogne in 2003 we fell in love with the blue skys and outstanding natural beauty of the area and just a year later we were living here!! As we drove down the driveway to view Le Banquet, it took our breathe away and we knew we were home. Oh and the warm weather helps!! We were voted The Guardian newspaper's "10 of the best family self-catering holidays in France". Idyllic riverside setting, extensive 4 acre grounds with stunning gardens. Awarded 4 stars by Dept du Tourisme of the Dordogne. Large 40ft x 20ft swimming pool and todddlers splash pool. Fully equipped games and information barn. Unbeatable location in the golden triangle!! The spotless and spacious kitchen has old oak beams and stone walls and is equipped with all modern conveniences including a Nespresso coffee machine and everything you could possibly need. A large dining table seats 6 in comfort and being open plan, you can drink and chat whilst dinner is being prepared. If you would like to see some more interior pictures of any of our cottages please ask for our website. Dramatic rock faces, sparkling rivers, green valleys, Chateaux, medieval villages, prehistoric caves and brilliant sunlight. The Dordogne, the very heart of the Perigord has been described by some as paradise. As you pass fields of sunflowers and corn and marvel at castles towering at the top of cliffs or visit the many 'Beau Villages' in the surrounding area you begin to understand why. The area surrounding Le Banquet is dominated by pre-history, beautiful architecture and gastronomy. The perfectly preserved medieval town of Sarlat is just 20 minutes away. The local markets are full to brimming with some of the best produce France has to offer. Whether you wish to visit one of the many UNESCO world heritage sites, caves with their drawings dating back 20,000 years, picnic by the banks of the Vezere River, taste the excellent wines from Bergerac and surround or canoe, horse ride and perhaps fish, Le Banquet is at the very heart of it all. If you are a food lover, then welcome to gastronomic heaven! Foie Gras, cepes, truffles and excellent restaurants - the region has it all.